They call it "Ho Chi Minh City" now. Baloney. The commies can call it "The People's Republic of Dinksville" for all I care. It will always be "Saigon" to me. Sounds more exotic and truly matches the mystery and intrigue that describes Saigon in the fall of 1966. After the less-than-glorious welcome I received just a day earlier (see "Welcome to Camp Alpha"), I was told to just "hang around" until I got orders. I guess in military terms that means you were on "casual duty". Better enjoy it because it may be the last "casual" moments of your tour there. I had heard that my Professor of Military Science (PMS) in the ROTC department of the university had been sent over to Vietnam. He was a full colonel in the Military Police corps and was assigned as the Provost Marshal of Saigon...the "top military cop" in the flagship city. Since Camp Alpha was just outside Saigon, I figured this would be a great opportunity to meet up with him. After all, I had just graduated a year earlier and had many occasions to chat with him on campus. Sure enough, I got directions to his office and we had a great reunion...for as short as it was. Col Sabolyk was a generous individual...always looking for some way to help you. So, he says to me: "Take my sedan and driver for the day; he will give you a tour of Saigon". Well, that was an offer I wasn't going to refuse! Off we went. The colonel's driver, Sp4 Jerry West, was a very knowledgeable and personable individual. He obviously knew the city well. He took me down the main streets of the city and over to the port area. The sights and scenes were very interesting to someone who had never been overseas before. I saw my first- ever USO building on the main drag in Saigon. Also saw the Majestic Hotel located on this very busy boulevard. I saw bicycles, motorbikes, motor scooters, pedi-cabs, rickshaws, bicycle-operated rickshaws, Lambrettas, lots of European-made autos and, very surprisingly, even a few Detroit-made US autos. Of course, the one that I saw was sidelined at the curb of the boulevard with its hood up. Typical. That was common in the states, too. Sp4 West took me to a few "side streets". I saw my first Vietnamese "laundry". (From what I saw, you were better off wearing the uniform dirty). I saw a couple of young Vietnamese boys selling popular US-brands of candy...and to this very day, I wonder "where the hell did they get that??" I saw a couple of shy, young girls sitting against a wall reading some books and they shielded themselves with the ever-present conical straw hats to prevent me from taking their picture. I saw an unusual Vietnamese funeral in progress with some locals carrying a casket on their shoulders as they headed for the cemetery. I say "unusual" because I noticed that the casket they were carrying was painted a bright red. The reason? The Vietnamese believe death to be a happy, not sad, event. Got another culture shock as I watched a crew at work installing a culvert. The crew included Vietnamese women who were picking up, hauling, loading, etc right alongside the men. They were considered no more, no less workers than the Vietnamese men. Talk about equality on the job! Maybe we brought "Women's Lib" back from Vietnam. The "well-to-do" Vietnamese women strolled the streets in a dress call the "ao-dai". Everybody else seemed to walk around in "black silk pajamas", or at least that's what we called it. Over at the port, I was introduced to a Vietnamese police officer named "Le Van Cho" who was obviously a friend and counterpart of Sp4 West. He gave me a big smile for a picture and actually wrote his name and address on a slip of paper (which I still have today). I guess he wanted me to send him a copy of the picture I had taken. Hah...little did he know where I was headed and that I would never return to Saigon. Got a picture of a German hospital ship named the "Helgoland". It was docked at the port of Saigon as some sort of humanitarian gesture; it was there to provide medical assistance to the locals who may have been impacted by the war. Also got a shot of the MACV Headquarters, complete with the general officer's flag and sedan parked out front. I didn't bother to go in. Before my little travelogue in Saigon ended, I asked Col Sabolyk if he had any openings on his staff. 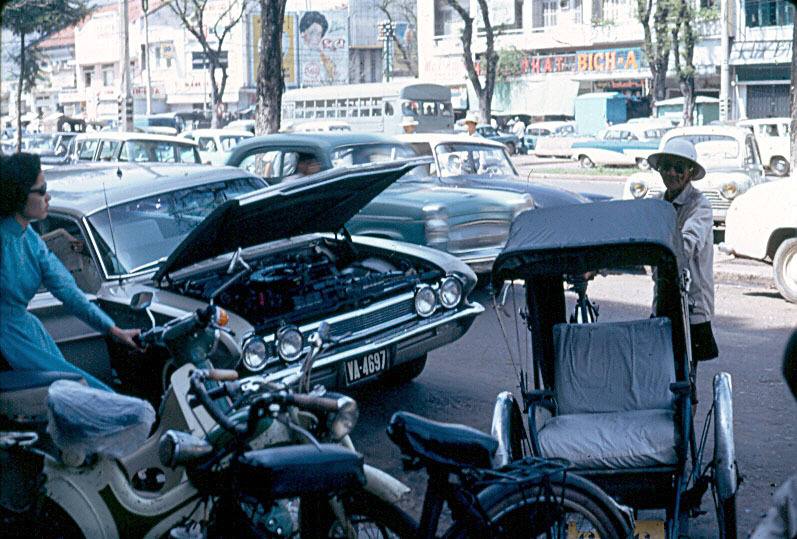 If there was a war going on, you couldn't tell it by the streets of Saigon. He told me that, with those "crossed cannons" sitting on my collar, there was no way in hell that he could keep any combat assets in the city on his staff. Well....it was worth asking, I guess. I left the streets of Saigon, never to return. And...since they changed the name, it ceases to exist also. Another casualty of the war, you might say. Footnote: The photos noted in this "war story" can be found in the Photo Gallery link.